Natural oil carefully and gently cares for the skin. Thanks kaffir lime essential oils, cosmetic has an exotic lemon flavor with a spicy tinge. The unique flavor of this medium has a calming effect on the nervous system, improves overall health and mood. Kaffir lime is rich in natural essential oils that refresh and provide a burst of energy and positive emotions. It offers a warm oil massage that will relax your muscles and warm the body. An exotic blend of clove oil and kaffir lime stimulate blood circulation and strengthen the body's detoxification processes. Rich in vitamin C, Kaffir lime is a fountain of youth and skin health. It activates its cells, prevents the appearance of wrinkles. Bath oil will have a relaxing effect makes the skin soft and supple. Kaffir lime essential oil has strong antiseptic properties, and also has a locally irritating effect of analgesic to relieve muscle pain, including after intense exercise. • Oil stimulates brain activity and supports mental performance, increases the ability to focus and concentrate on the subject. • Essential oil of lime affects the body as a tonic and invigorating, warming and improving blood circulation means. lime essential oil components stimulate the production of the neurotransmitter norepinephrine in the body, enhances the activity and the immune system. 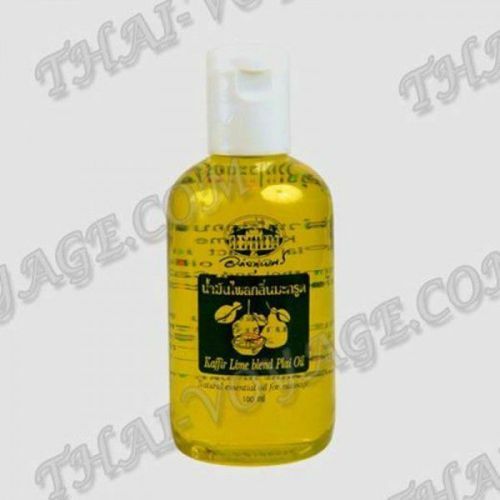 • Essential oil of kaffir lime is an aphrodisiac. Its warm, spicy fragrance imparts novelty feelings and sensations, gently breaks down inhibitions and brings sensuality and eroticism in a familiar reality. Application: used for massage, baths and flavoring premises. After the massage, do not take a shower for 2-3 hours. After the bath Do not rinse and blot the moisture with a towel. Composition of the product Zingiber cassumunar roxb (Plai); Extract in sunflower oil; Camphor; Menthol; Citrus hystric oil.